The Federal Labor Party lurched further to the right, after leader Bill Shorten won majority support for the turn-back of asylum boats at the Labor National Conference in July. Shorten has even signaled his willingness to consider turn-back directly to Sri Lanka or Vietnam, although he says there would be “qualifications”. The move cements Labor’s disgraceful bipartisan agreement with the Liberals’ anti-refugee policies, including offshore detention on Manus Island and Nauru and the denial of resettlement in Australia to all refugee boat arrivals. But there are significant divisions inside Labor. The debate over turn-backs was the most heated of the Labor Conference. Forty two per cent of delegates voted against turn-backs after the Left moved amendments to rule out the policy. Tragically, two of the traditionally most left-wing unions, the MUA and the CFMEU, broke ranks with the Left and backed Shorten. Despite the Labor leadership’s capitulation, the vote has helped to harden opposition to turn-backs inside Labor, as well as within the community generally. It is a far better result than Shorten simply getting his way without any debate or opposition. 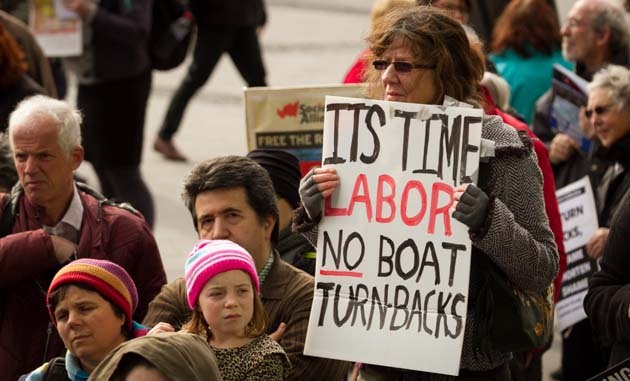 The challenge for the refugee movement now is to fan the flames of dissent inside Labor, and draw more unionists and rank-and-file Labor members into the campaign in the workplaces and on the streets. Outside the conference, 400 people rallied to demand Labor reject turn-backs and end its support for mandatory detention. There were banners from refugee groups across the country and a large contingent from Grandmothers against the detention of refugee children. The rally was also addressed by Afghan refugee Mohammad Baqiri, ACT Labor MP Yvettte Berry and Michele O’Neil, National Secretary of the Textile, clothing and footwear union, who brought the conference to its feet when she spoke in the debate that followed. Labor’s Shadow Immigration Minister Richard Marles declared that, “A future Labor government must have at its disposal the full suite of measures to keep this journey [between Java and Christmas Island] shut.” And former Immigration Minister Tony Burke even cried crocodile tears for the asylum seekers that died at sea during his time as Minister. But as Michele O’Neil pointed out, “when you turn a boat around, you are turning a boat around into a risky, unsafe perilous journey”. At least 300 Rohingya died due to boat turn-backs by Indonesia and Malaysia in May this year. As she told the conference, “It’s not a turn-back boat policy, it’s a turn-back desperate people seeking refuge policy”. Shorten portrayed the policy that was finally adopted, involving an increase in the refugee intake to 27,000 and increased funding for the UNHCR in countries like Indonesia and Malaysia, as “a new direction”. But the increase to 27,000 will be made over ten years! The day after the vote the Left’s Anthony Albanese argued that, “what we’ve adopted…will ensure indeed that boats don’t have to be turned around because I don’t believe the boats will come”. Labor is promoting its policy as a version of the “regional solution” promoted by some sections of the movement. Shorten indicated “a portion” of the increased intake would come from countries in our region like Indonesia and Malaysia, although how many is not clear. But Labor sees this as going hand in hand with offshore processing, and the use of detention on Manus Island and Nauru to keep out anyone who arrives by boat. Guaranteed resettlement from Indonesia, to give asylum seekers an alternative to taking a boat on the last leg of their journey, has long been advocated by the refugee movement. But this cannot be an excuse for capitulating to the xenophobia about boat arrivals. Whatever happens in Indonesia, we will still need to welcome boats of asylum seekers. The boats that arrive directly on Australian shores from Sri Lanka and Vietnam cannot be turned around without handing people back to their persecutors. Labor’s policy still contains some improvements on the Liberals’—such as abolishing Temporary Protection Visas, as well as other minor changes like restoring access to the Refugee Review Tribunal. But it is clear that Shorten wants to keep pandering to the racism against refugees, and that the campaign will have to fight Labor in power just as hard as Abbott.